CAMBRIDGE, N.Y.—Don Boyajian, a third-generation Armenian American, has announced his candidacy for New York’s 21st Congressional District, representing the Adirondack Mountains and Thousand Islands regions of the Empire State. If elected, he would be the third U.S. Representative of Armenian heritage serving in the U.S. House, joining Congresswoman Anna Eshooo (D-Calif.) and Congresswoman Jackie Speier (D-Calif). The grandchild of Armenian immigrants from Aintab, on his father’s side, and Palu, on his mother’s side, Don represents the third generation in his family to live and work in the U.S. During the Armenian Genocide era, his father’s family settled in Saratoga County, N.Y., where they operated a sheep farm, and his mother’s family put down roots in Providence, R.I. He and his family are active in St. Peter Armenian Apostolic Church, where his mother recently received the Women’s Guild’s Woman of the Year Award. Professionally, Don is an environmental and municipal attorney at Dreyer Boyajian LLP, a firm his father co-founded. Don graduated from Colgate University and Cornell Law School, where he clerked in the U.S. Attorney’s Office (NDNY), New York Office of the Attorney General (Environmental Protection Bureau), and the Securities and Exchange Commission. Don also served as a Legislative Aide in the U.S. Congress, where he focused on agriculture, natural resources, and energy policy. Don, a Democrat, will face a primary election to win his party’s nomination, and then challenge incumbent Republican Elise Stefanik, who has no meaningful record of support for Armenian-American issues. Even though I'm not a fan of Democrats because of the political correctness fiasco, I'll support his candidacy and so should every voting Armenian in the US. Good luck!!!!!! PanARMENIAN.Net - Former Alaska Gov. Sarah Palin endorsed Danny Tarkanian for the U.S. Senate in Nevada, Breitbart News reports exclusively. Tarkanian, who is of Armenian descent, announced his 2018 Republican primary challenge against incumbent Senator Heller for a U.S. Senate seat from Nevada in early August. “Commonsense Conservatives in Nevada and across America need to unite and help win this critical fight. 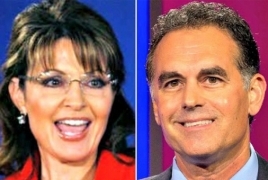 I strongly endorse Danny Tarkanian for the United States Senate and look forward to helping him win this important election,” Palin said in the statement endorsing Tarkanian. Tarkanian in a statement of his own responded by thanking Palin. Polling data on the race suggests that Tarkanian has a chance to topple Heller in Nevada, should he gain momentum moving into the next several months. Senate Majority Leader Mitch McConnell, however, is likely to fight as hard as he can to save Heller—but endorsements from major national conservative figures like Palin open the door to a potential upset. PanARMENIAN.Net - GOP U.S. Senate challenger Danny Tarkanian has blown past incumbent Sen. Dean Heller (R-NV) per a new poll out of the state of Nevada, Breitbart News reports. Tarkanian, who is of Armenian descent, announced his 2018 Republican primary challenge against Heller for a U.S. Senate seat from Nevada in early August. Tarkanian, per the new poll from JMC Analytics, is up at 39 percent in the new survey. His lead towers eight points over the incumbent Heller’s 31 percent. A whopping 31 percent are undecided between Heller and Tarkanian. Even so, when given the choice of Heller versus not Tarkanian, a majority of Republicans in Nevada—51 percent—want someone other than Heller, 31 percent would renominate Heller, and 18 percent are undecided. The survey of 700 likely GOP voters in Nevada was conducted from Aug. 24 to Aug. 25 and has a margin of error of 3.7 percent with a 95 percent confidence interval. He was interested in running a few years ago, Danny, he came with his wife and children to Badarak in Carson City, I put the fact that he was running in the news letter. We'll see how he does this time. You'll never know unless you try. We have a very old established and anchored communities all around the US it's about time that they go into politics in big numbers and work within rather than begging others to do it for us. They should be supported by all regardless of their party affiliation whether you are Democrat or Republican. The Armenian National Committee (ANC) of Albany announced Friday its endorsement of Don Boyajian, Democratic candidate for New York’s 21st Congressional District, representing the Adirondack Mountains and Thousand Islands regions of the Empire State, Armenian Weekly reported. Boyajian will face a primary election to win his party’s nomination, and then challenge incumbent Republican Elise Stefanik, who has no meaningful record of support for Armenian-American issues. If elected, Boyajian will be the third U.S. Representative of Armenian heritage serving in the U.S. House, joining Congresswoman Anna Eshooo (D-Calif.) and Congresswoman Jackie Speier (D-Calif). The grandchild of Armenian immigrants from Aintab on his father’s side and from Palu on his mother’s, Boyajian represents the third generation in his family to live and work in the U.S. During the years of the Armenian Genocide, his father’s family settled in Saratoga County, N.Y., where they operated a sheep farm, while his mother’s family put down roots in Providence, R.I.
Professionally, Boyajian is an environmental and municipal attorney at Dreyer Boyajian LLP, a firm his father co-founded. He graduated from Colgate University and Cornell Law School, where he clerked in the U.S. Attorney’s Office (NDNY), New York Office of the Attorney General (Environmental Protection Bureau), and the Securities and Exchange Commission. Boyajian also served as a Legislative Aide in the U.S. Congress, where he focused on agriculture, natural resources, and energy policy. 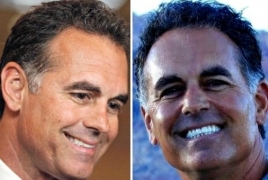 LAS VEGAS—A new poll of Nevada’s third congressional district Republican primary voters shows that former Senate candidate Danny Tarkanian has taken a commanding lead upon switching to the congressional race, with President Donald Trump’s endorsement, Breitbart reported. 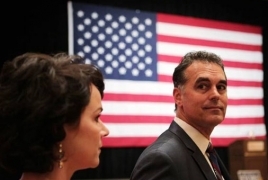 American Armenian Danny Tarkanian, at 37 percent, towers over the other candidates remaining in the primary. Michelle Mortensen gets just ten percent, Scott Hammond gets nine percent, and David McKeon gets one percent. Victoria Seaman, who dropped out of the race upon Tarkanian’s entry with Trump’s endorsement, got nine percent—while 34 percent were undecided. The survey of 400 respondents was conducted from March 10 to March 11 by Strategic National, with a margin of error of 4.9 percent, and provided exclusively to Breitbart News ahead of its public release. Tarkanian has also been endorsed by the Armenian National Committee of America Las Vegas chapter. Tarkanian, a strong supporter of President Trump, was the GOP nominee for this very seat in 2016, but lost to now Rep. Jacky Rosen (D-NV) in the general election after 2016 GOP senate nominee in Nevada, then-Rep. Joe Heck (R-NV) tanked Republicans statewide by distancing himself from Trump in the lead up to election day. Rosen is running for the U.S. Senate and is expected to face off against Sen. Dean Heller (R-NV) in the November general election. Tarkanian announced Trump’s endorsement of his congressional campaign in a statement last week. ” I am confident I would have won the US Senate race and done a great job representing the people of Nevada in the Senate, but the President is adamant that a unified Republican ticket in Nevada is the best direction for the America First movement. With President Trump’s full support and endorsement, I am filing to run again in CD3 with the firm belief that we will finish what we started in 2016 and win in 2018,” the statement said, in part. That came after a Trump tweet urged Tarkanian to switch to the House race from the Senate race, adding that he would have the president’s backing in doing so. “It’s a seat the Democrats currently hold, so we can take a seat back from the Democrats,” Tarkanian said on SiriusXM Patriot Channel 125. During a radio interview with Wayne Allyn Root, Nevada congressional candidate Danny Tarkanian defended civilians having firearms on the basis it could have prevented the Armenian genocide. Root brought up former Supreme Court Justice John Stevens' recent op-ed, which argued for the repeal of the Second Amendment. The radio host told listeners he has a Jewish background and one of the first things Adolf Hitler did was disarm his future victims. Root wondered why his Jewish friends, given their ancestry, continued to advocate for increased restrictions on firearms and Tarkanian also used his own background as an example of gun control enabling mass murder. PanARMENIAN.Net - U.S. President Donald Trump has congratulated Armenian-American Danny Tarkanian on his big GOP primary win in Nevada. Tarkanian, son of legendary UNLV basketball coach Jerry Tarkanian, and Democrat Susie Lee, a Las Vegas philanthropist, captured their parties’ nominations in southern Nevada’s 3rd District, where incumbent Democratic Rep. Jacky Rosen advanced to face GOP Sen. Dean Heller in what promises to be one of the most important races for the U.S. Senate, The Associated Press said. "Danny worked hard an got a great result. Looking good in November!" Trump said in a tweet. Tarkanian — who had won three previous GOP primaries, but lost five general elections — lost to Rosen in 2016 by fewer than 4,000 votes in the 3rd District, which covers much of suburban Las Vegas. He launched a combative primary bid to knock off Heller, but bowed out of the race in March under pressure from President Trump and others, and announced his candidacy for what promises to be the costliest congressional race in Nevada this fall.